Editor’s Note: This piece by Elliott H. Gue first appeared in Capitalist Times‘ sister publication Energy & Income Advisor in July. We thought Capitalist Times readers might like to read a still-relevant sample of the in-depth energy analysis offered in EIA. If you’re invested in the energy market, invest in a subscription of EIA. Commodity traders call natural gas the widow-maker because of its breakneck volatility and extreme price swings. Nevertheless, our outlook has called for the thermal fuel to remain volatile but range-bound, as spikes toward $3 per million British thermal units (mmBtu) will sow the seeds of their destruction by incentivizing production growth and prompt electric utilities to switch from gas to coal. Conversely, moves below $2 per mmBtu will encourage demand and prompt exploration and production companies to slow their drilling and completion activity. Against this backdrop, our strategy for gas-levered exploration and production companies has involved buying the dips and selling the rips in the underlying commodity. Weather-driven gyrations aside, natural-gas prices are close to an important top this summer that could set the stage for the thermal fuel to drop to between $2 and $2.50 per mmBtu later this year. Let’s start with the supply side of the equation. Natural gas plunged below $2 per mmBtu in the first half of 2016 because of US production growth and reduced demand during the unusually warm winter of 2015-16. However, upstream activity and natural-gas supplies responded to this weakness. The US gas-directed rig count, for example, tumbled to a low of 81 units last summer, from a high of 192 in December 2015. 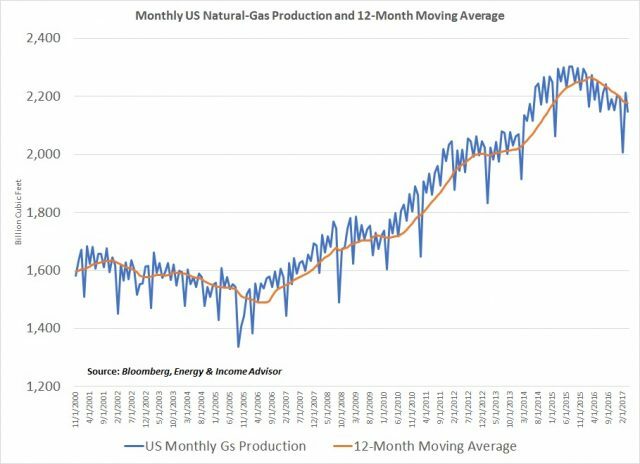 Monthly data on US gas production is volatile and subject to large seasonal swings; however, a look at the 12-month moving average shows that US gas production began to inflect lower by last May. In February 2017, US gas production fell 7.3 percent year over year. This helped firm up prices in 2016, propelling front-month gas futures to highs of about $4 per mmBtu in December. Once again, the tide appears to have turned in favor of the bears. With natural-gas prices averaging more than $3 per mmBtu since late 2016, the US gas-directed rig count has more than doubled since the end of August 2016, surging to 189 drilling units as of early July. Stepped-up drilling activity won’t translate into production increases for a few months, but data from the Energy Information Administration indicate that the year-over-year drop in monthly gas output narrowed to 2 percent in April—the lowest level in more than 12 months. Associated gas production from oil wells could also present a headwind, as these volumes tend to respond to oil prices. In addition to the Eagle Ford Shale, the red-hot Delaware Basin in West Texas and central Oklahoma’s SCOOP and STACK plays produce significant volumes of associated natural gas. Break-even costs for natural gas have also come down significantly in some US shale plays. At the MLP Association’s investor conference earlier this summer, several midstream operators highlighted how longer laterals and enhanced completion techniques had revivified the Haynesville Shale, a prolific gas play in Louisiana that had fallen out of favor. The number of active rigs in the Haynesville Shale has more than tripled since September 2016, reaching 43 drilling units; this resurgence suggests that the Marcellus Shale may no longer be the only shale gas play that can grow its output at low prices. And while gas supply is rising, the demand outlook also appears to be deteriorating. 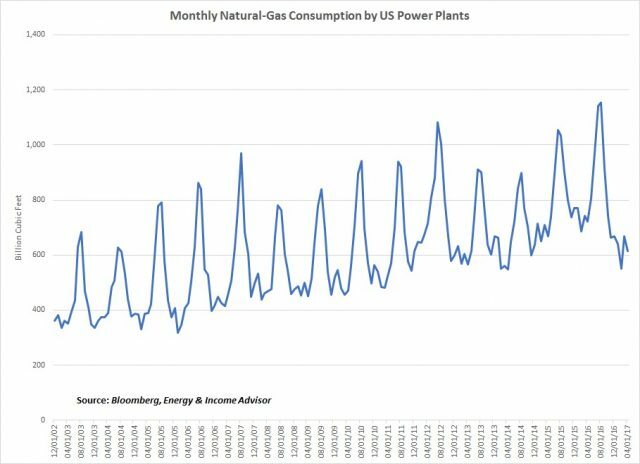 Electric power plants’ natural-gas consumption has grown for more than a decade, and during last summer’s cooling season, demand hit an all-time high. However, over the first four months of 2017, US power plants have consumed about 15 percent less natural gas on a year-over-year basis, as an uptick in prices has prompted generators to switch to coal, where possible. Accordingly, US power plants’ coal consumption has increased by 15 to 20 percent. During the summer, high temperatures and demand for air conditioning drive weekly moves in gas inventories and can result outsized price volatility. On July 5, for example, natural gas prices plummeted 6.2 percent after several weather forecasters called for a break in the summer heat. Six days later, the thermal fuel’s price jumped 4 percent after the same forecasters called for a heatwave through mid-July. 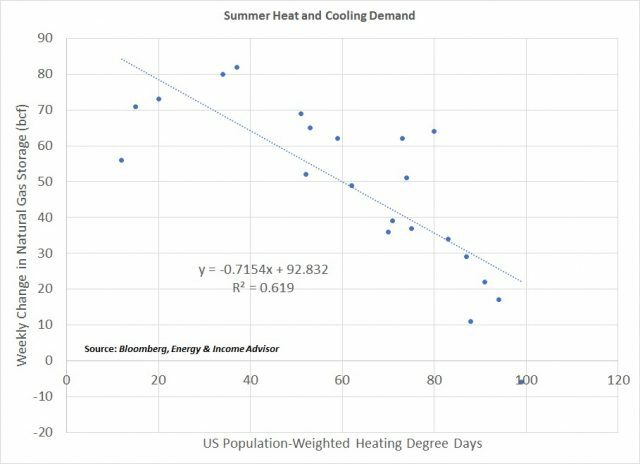 Our graph plots weekly population-weighed cooling degree days—a temperature-based measure of air-conditioning demand—against the weekly changes in gas inventories through last year’s cooling season. The trendline has an r-squared value of 0.619, indicating that cooling degree days explain about 62 percent of the weekly change in natural-gas inventories. But viewing US gas storage data on a weather-adjusted basis reveals much more about underlying supply and demand conditions. Based on the trendline from 2016, natural-gas inventories have increased by a larger-than-expected magnitude in seven of the nine weeks of this year’s cooling season. May and June 2017 have been about 17 percent hotter than last year, suggesting that gas storage levels would increase at a much slower pace because of increased demand. However, these inventories have increased by 632 billion cubic feet since the beginning of May, compared with a build of 554 billion cubic feet last year. A combination of rising production and gas-to-coal switching at power plants likely has driven this phenomenon. After summer cooling demand peaks in late July or early August, the pressure that these forces exert on natural-gas prices could intensify. Readers often ask whether further growth in US natural-gas exports could change our view on the commodity, especially after the shortages that parts of Australia have experienced. Surging production from prolific shale plays has depressed US natural-gas prices over the past decade, reducing the need to import the thermal fuel and driving export growth. US natural-gas exports to Mexico, for example, have more than doubled over the past three years and constitute about 45 percent of shipments to international markets. 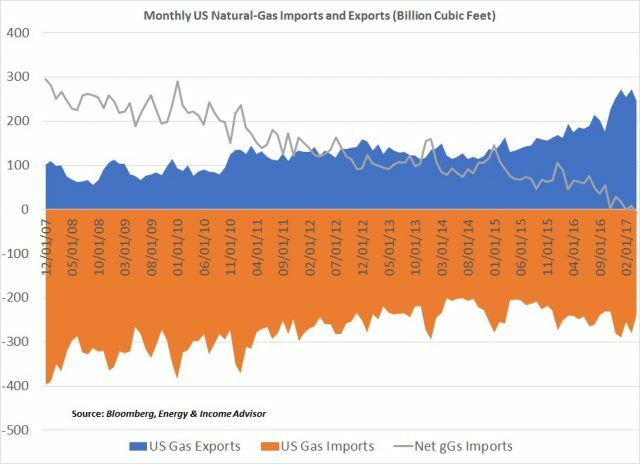 Whereas gross US natural-gas exports peaked at 270 billion cubic feet per month (about 9 billion cubic feet per day), the country produces about 2.2 trillion cubic feet per month, or 73.3 billion cubic feet per day. Against this backdrop, rising US exports alone would struggle to normalize gas storage levels, especially when you consider how quickly producers can bring incremental supplies onstream. As with the oil market, investors should keep an eye on the aggregate reported short and long positions that hedge funds have built in natural-gas futures contracts. The same basic relationship holds: Spikes to the upside and downside in long and short positions signal when the market has become overly bullish or bearish. 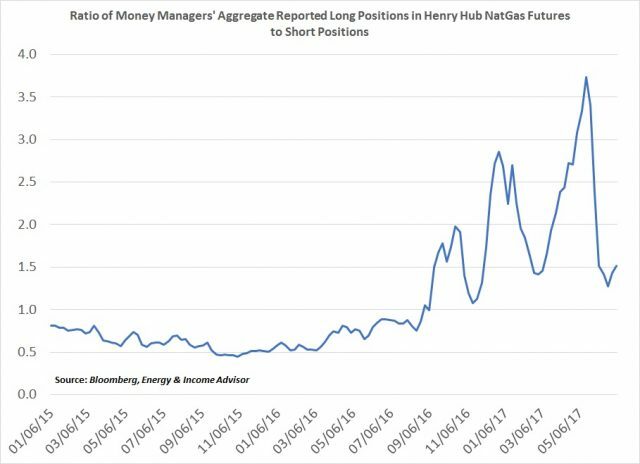 For example, the ratio of money managers’ long to short positions in gas futures spiked in October and December of last year and mid-May 2017, signaling a near- to intermediate-term top in the commodity’s price. Today, the ratio of longs to shorts stands at about 1.5, close to its lowest levels this year—a signal that short covering could drive an oversold bounce in natural-gas prices, especially if the weather remains hot. That said, hedge funds amassed enough bets against natural-gas prices to swing the pendulum to a net short position that persisted for several months. If the fundamentals in the US natural gas-market continue to deteriorate in the back half of the year, the commodity should struggle to rally above $3 per mmBtu for any length of time. In this scenario, money managers could move to a net short position. Bottom Line: We remain bearish on the prospects for natural gas in the second half of the year and continue to view prices above $3 per mmBtu as unsustainable. Investors with a longer time horizon should stick with our strategy of taking advantage of selloffs in natural gas to $2 per mmBtu or less as an opportunity to add to our favorite gas-levered midstream names and select upstream players.